The opportunity over many years to travel and fish most of the best pike fisheries in North America allows the In-Fisherman staff to see how effective some techniques are during certain yearly periods, even across a spectrum of diverse waters. The precision edge techniques covered here work during April, May, and June on Devils Lake, North Dakota, but they're much the same as those that work at Red Willow Reservoir, Nebraska; Fort Peck Reservoir, Montana; Lake Oahe, South Dakota; Last Mountain Lake, Saskatchewan; Coeur d'Alene, Idaho; Lake Thompson, South Dakota; Mille Lacs, Minnesota; portions of Lake of the Woods, Minnesota, Ontario, and Manitoba; Rainy Lake, Ontario; Cross Lake, New York; Henderson Harbor, New York; Bay of Quinte, Ontario. We drop names to show that waters near you likely qualify for this discussion. Slight technique modifications may be necessary, depending on where the fish are holding in a body of water. On a lake like Devils Lake, pike (and walleyes and white bass) push up near emergent vegetation or near the front face of submergent shallow vegetation — at times against the front face of a line of submerged brush or timber. At times they're right in the brush and timber. They may also hold on shallow rock or gravel bars or in and over slightly deeper weedbeds, although they prefer the previous options. On lakes like Oahe on the Missouri River, South Dakota, pike often hold on shallow shoreline-connected rock or gravel bars, but also push up against lipped shoreline drop-offs, first in the back ends of creek arms and later farther up in creek arms toward the main lake. On Lake Winnebigoshish, Minnesota, the fish usually are on shallow rock and gravel bars — or dips and depressions in those structures, sometimes close to shore. The presence of weedgrowth on most spots intensifies fish use. These aren't the only patterns in play, but they are key patterns. Timing varies. Things are in full swing by mid to late April on Red Willow, in early to mid May on Devils Lake, and in early June on Last Mountain Lake. On Oahe the fishing may begin as early as late March. Actually, it's possible to get a bite going on many waters, including big rivers like the backwaters of the Mississippi, beginning right after ice-out. It's fun because often you're pitching to cover or a shoreline, or a weededge that grows to the surface, so you're constantly visualizing potential pike position as you make the cast. You may also be standing on shore and casting out, in the back ends of creek arms or in the backwater areas in rivers, reservoirs, and natural lakes. 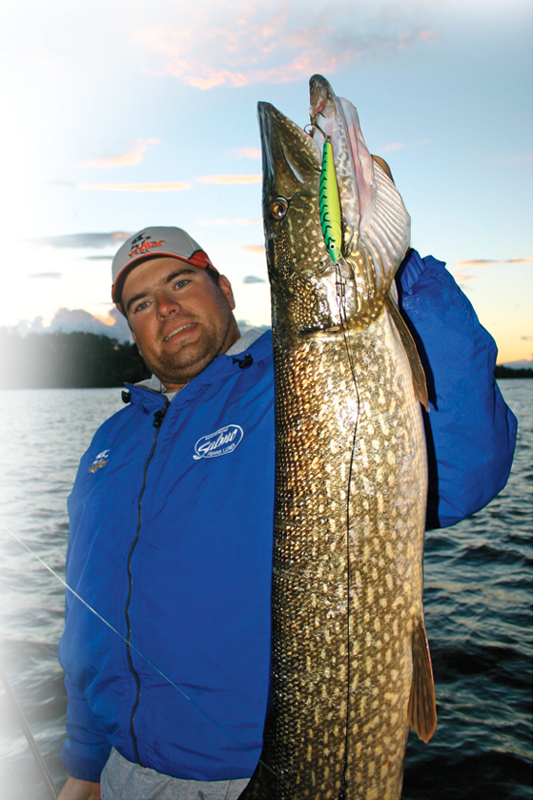 This fishing is in contrast to the early season strategies covered in last season's Pike & Muskie Guide, where we mainly outlined the opportunity to catch fish on deadbaits. That too remains a key strategy during early season. In-Fisherman Editor In Chief Doug Stange's favorite lure for most of this work has long been the CountDown Rapala, typically a #5, #7, or #9. Stange is a longtime fan of larger pike lures, but he's always been a proponent of depth control before all other factors, including speed and vibration. Size as a factor is even farther down the line in importance. The CountDowns are just right when you want to work the top 2 to 3 feet of the water with 8-pound mono or a 10-pound fused line like Berkley FireLine or Sufix Fuse. Cast, tighten up, count down 3 one-second counts, and you're in the game. If the water slips to 5 feet deep, a 5-count gets you 3 to 4 feet down. Perfect. Pike aren't always tight to the bottom. Only 1 in 1,000 CountDowns won't work right out of the box, but Stange usually tinkers with them to get a wider wobble. Remove the split ring and with pliers squeeze the nose attachment slightly flatter. Then ever so slightly bend it down. Use a small snap (no swivel) or a loop knot to attach the lure to your line — again, no split ring. Drop the lure in the water and pull it forward. You might have to bend the nose down just a bit more. You may also have to adjust the nose barely left or right to correct if the lure is now kicking left or right. If it's kicking slightly right, bend slightly left and so on. Doing this only takes a minute or so. Why mess with something that was tank-tested to run true in Finland? Well, many times you shouldn't. In this case the wider wobble calls in fish better, triggers them better, and allows you to run the lure just a little slower if you have to. Changing the pull point also helps the lure start immediately after you count it down and kick it into action. Work the color experiment to include gold versus silver. Stange also uses yellow perch, and at times firetiger is good in darker water. Blue works well in many waters but we suspect that's because pike don't see blue well and probably mistake it for a lighter shad of black than that found on the silver pattern. Still, something about blue often gets them to go. Many other crankbaits work, including quick-diving baits like the #5 or #7 Shad Rap. Pitch it to an edge and crank it down; the diving lip takes it immediately to depth. The CountDown, being heavier, casts better into wind — and it casts farther. When fish are really shallow, suspending lures like the Rapala X-Rap or Smithwick Rogue also work well. You need a light tieable wire leader like those from American Fishing Wire and Aquateko's Knot2Kinky. Our friend Jason Mitchell has guided on Devils Lake for the past 12 years. Mostly his clients want to catch walleyes, along with pike. He prefers the Salmo 8F Perch when long casts are necessary. Mostly, he and his guides use the #5 Shad Rap, along with #4 and #5 Salmo Hornets. The Jointed #5 Shad Rap also has its fans. Mitchell: "We fish almost every day for two straight months starting in mid-May, so you run into lots of different situations. Depth is the most important factor, but walleyes and pike (and of course white bass) also are often triggered by a difference in the vibration pattern of different lures — and of course one retrieve cadence or another can be the ticket on some days. So, along with those I've already mentioned, sometimes we go with suspending lures like the #8 Rapala Husky Jerk, the Salmo Sting, and the Smithwick Rattlin' Rogue. Once the weeds push up high, we also catch fish on #5 and #7 Shallow Shad Raps and the shallow-running Berkley Flicker Shad." Stange: "Some days or sometimes during a given day, pike are all over a straight retrieve. Other days or at certain times during a day, it takes a little hitch in the retrieve to trigger fish. A lot of times, snapping the lure several times gets fish to go. So, with a CountDown you get it to depth and snap the lure right into action, continue with a straight retrieve for 4 or 5 feet, then snap the lure twice, continue another couple feet and snap again twice — continue like that all the way back to the boat. We do the same thing with divers like the Shad Rap, Hornet, or Livetarget's series of lifelike divers, including Gizzard Shad, Perch, Bluegill, and more. With suspending lures you can snap 3 or 4 times and then pause the lure for a second before continuing. So we're always playing with retrieves." Mitchell: "During early season, fish look for those edges in protected areas that don't get wild fluctuations in water temperature. Pike in particular like to be tucked back into areas well away from the main lake. Steady or warming temperatures are the key to active fish. We search in protected bays within big bays away from the main-lake basins. You've already described the kind of cover that pike usually use in those areas. Often we spend the entire day pitching to shallow emergent weededges. But a lot depends on weather and how the day unfolds. "We've learned to read conditions and subsequently how to get on fish. Peaking fish activity usually is staggered, with individual fish or small groups of fish becoming active throughout the day, as the sun warms the water. So it's important to fish through an area, note where you get some fish activity, and continue moving. It doesn't work to camp on spots. Pick off a fish or two or three in general areas and move on — then return later. Hit spots that hold fish 3 or 4 times a day and you usually get a few each time through." Stange: "During protracted periods of warmer weather and as the season wears on, a little wind blowing into spots is a good thing. Heavy wind pushes fish away from edges and usually pushes them deeper. The perfect wind speeds run from about 5 to 10 mph. Once winds approach 10 mph, I start to move out away from edges and check classic rock bars running 3 down to about 7 feet deep. It just depends on the lake. In lots of the shallow prairie lakes there aren't that many spots like that; so those that are available almost always have fish." Mitchell: "On dark days when water temperature might not be climbing, I often back the boat 100 feet or so (as opposed to 50 or 60 feet) off the area where I'm casting. Long casts are better at getting tentative pike to follow and commit somewhere along the retrieve. You're also more likely to see fish that follow and therefore return later to check for active fish. "If I think someone's been through an area just before me — and I really like the area — instead of moving to a different spot, I might also switch to a swimbait. A 4- or 5-inch Berkley Hollow Belly Swimbait or a 4.5-inch Northland Slurpies Rock-R-Minnow on a 1/4- or 3/8-ounce jighead often triggers fish that won't go on anything else. Folks around here are just beginning to discover the swimbait phenomenon. Taking a page from Stange's play book, I often rig the body flat instead of straight up and down the way they where designed to be fished. The action is just as good or better and they fish well shallower like that." Pike in shallow water usually don't hold for long in pockets and on points. They're constantly on the prowl, on the hunt. Pockets and points are good areas to cast to, but they aren't ambush areas as might be the case when fishing for bass; so make a cast or two but not 4 or 5." Early on, it's so important to find areas that don't get wild fluctuations in water temperature. But wild weather is inevitable. If storms disrupt the best protected spots for days on end, as Stange suggests, sometimes fish make a major move to deeper structure until conditions improve. On Devils Lake, they move out of bays to mainlake basin spots that usually are better during summer. Try main-basin points and humps in 10 to 15 feet of water. But fishing those kinds of areas is a different story. Our focus here is on the primary bite, the shallow bite, during early season. That's where pike want to be — and give them decent weather and that's where they're going to be. Stange says this fishing is simple and straightforward, yet largely overlooked in many areas of North America. "Pike and other fish want to be shallow when conditions allow it," he says. "That's where the warmest water is; so that's where much of the available food is, and that's where pike metabolism is percolating right along near optimum. Not only is this fishing highly productive, it's maximum fun."